The Young Statisticians Section (YSS) of the Royal Statistical Society are seeking enthusiastic individuals to join the YSS Committee for 2017. Being a member of the YSS Committee is a commitment but also very rewarding (and fun!) We are particularly looking for people who are keen to champion new ideas for reaching out the early-career statistics community, and to help organise events targeted at young statisticians. We hold three committee meetings per year, so most events and initiatives are organised remotely via email or phone conference. by 6pm on Friday 23 September 2016, with a short blurb (up to 250 words) summarising your background and why you’d like to join the committee. Please note that to take up a position you will need to be a full fellow of the RSS. 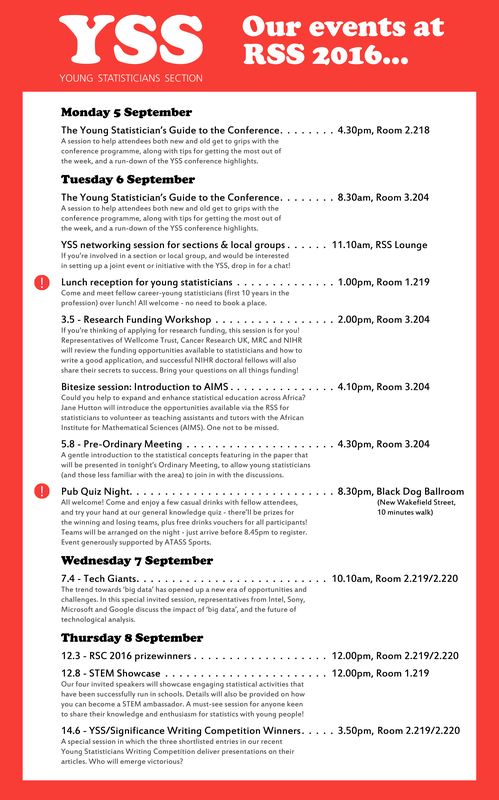 A final note: if you’re attending the RSS Conference in Manchester next week (5-8 September), and would like to find out more about the YSS, please do come up and have a chat with the current committee – just look for the red t-shirts! ANNOUNCEMENT – Our events at RSS2016! The YSS will be running no fewer than 12 events at next week’s RSS2016 conference in Manchester – a new record! Click on the flyer below to find out more. We’ll be out in force at the conference with no fewer than eight members of the YSS committee in attendance – look out for our eye-catching red t-shirts! 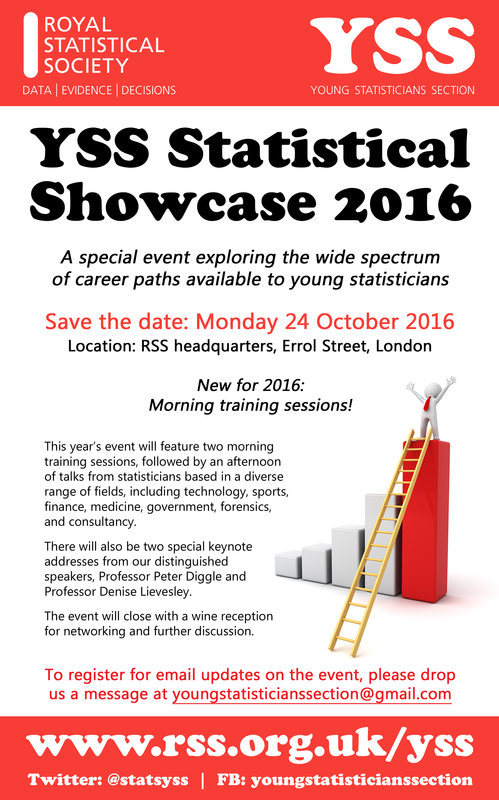 This year’s Statistical Showcase will take place on Monday 24 October 2016 – save the date!